omnivores, which have a very varied diet as they eat both animal prey and vegetable matter. In practice, diets are not always so easy to define. In a natural setting fish eat what they find, and so sometimes a herbivore will eat a small animal taking shelter in the plants that it normally eats. Carnivorous fish mainly require proteins and lipids, while herbivores have a special need for carbohydrates, and omnivores demand a mixture of proteins, carbohydrates, and lipids. Bearing in mind the limitations of these definitions, all three diets can be found among those given to aquarium fish, although there are some exceptions. The aquarist should also take care that vitamins and mineral salts form part of a varied and balanced diet, especially through the addition of fresh or live food. A wide palette of foodstuffs stimulates the growth and reproduction of the aquarium's inhabitants and strengthens their resistance against disease. As such, it is the best precaution that can be taken against disappointing results and lack of success. There is a tendency to overfeed aquarium fish and produce some rather flabby specimens. Moreover, there is an increased risk of pollution in a confined space: the more a fish eats, the more it excretes nitrogenous substances, and that is without counting the foodstuffs that quickly decompose in the water in the aquarium. 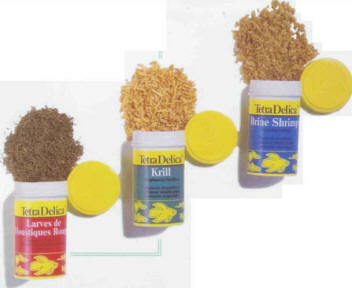 Specialist aquarium stores supply artificial fish food in a variety of forms and sizes. An adult fish only eats 1 or 2% of its own body weight per day, although a juvenile consumes twice that amount. Very light flakes involve little risk of overdosing, in contrast with other foodstuffs which can sometimes slip out of the hand. Whenever possible, it is advisable to divide the daily input into separate portions, twice a day for adults, more often for fry. As fish in their natural habitat are unlikely to eat regularly every day, most aquarium fish will therefore cope well with a shortterm fast. Some aquarists impose a one-day fast per week to compensate for the likelihood that the fish have been overfed on the other days. Fasting is however not suitable for fry as it may slow their growth considerably.